First off, a little background: I’ve worked at UA since 2001 and 2018-19 marks the 14th year that I’ve been a Department chair here; add to this the search committee’s on which I served in my previous job and I’ve seen my share of searches from the other side of the desk, whether playing the role of a member, the committee’s chair, or the person to whom the committee reports. I’ve also been an interviewee, of course, for instructor work (that was on the phone), for tenure-track work (at conferences and on campus; I missed the mark on all but one of those), for tenured work (that was the move to Alabama from southwest Missouri), even once for Dean of an Honors College (didn’t get the nod for that one). So those are the various places from which these comments come. 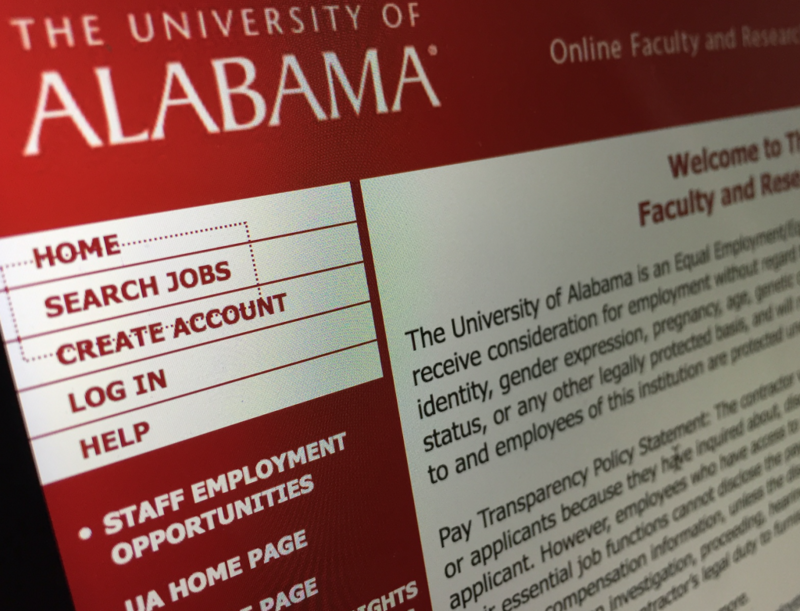 Second, this post is about tenure track work; I’m well aware of trends in higher ed and the current prominence of contingent labor (having started my own career as an Instructor and having hired Instructors during my time as Chair), But, at least here at Alabama, we’ve been successful ensuring that the vast majority of our hires are for full-time tenure-track faculty members, having only once had two full-time instructors in the Department at the same time, though usually employing one, as we currently do (on a three year contract, teaching 4/4 but with only 2 preps each semester). So the vast majority of our experience is with tenure track searches. It has long struck me that a successful hiring process is, from a Department’s point of view, an early review for tenure. That is, why would a Department want to go through proposing a position to their admin and then carrying out a search, followed by investing a lot of time and energy (and yes, a fair bit of financial resources as well) in someone who they thought would not be successful in one day obtaining tenure and promotion there? I’m not sure how others see it but, speaking as a Chair, I hope the person we hire goes on to establish a long and successful career in our Department (and even becomes the kind of scholar and teacher who other Departments want to poach — if so, it’s my job to try to make them want to stay here, of course) and so the hiring process is an opportunity to make very early (but yes, still speculative) judgments about what we think this or that person’s chances are in succeeding at our university. Now, we’d be utterly unprofessional if we thought that someone fresh out of grad school or someone with only a little bit of teaching experience was somehow ready to apply for tenure, so it means looking at a person’s CV, looking at their experience and accomplishments to date, judging what we can from the letters and other materials they submit as part of their application, and then trying to project 5 or 6 years out. If she was able to do this before the end of grad school, if he was able to do that while also writing a dissertation, then what might they do working with us…? So the application and interview for a tenure-track Assistant Professor isn’t really all about what the person will do next year, if we hire them (though, sure, next year has a lot of things that’ll need to get done), but, instead, what they might do during a career with us. Like I said, it’s a speculative judgment, to be sure, and there’s enough variables that one can’t always be right. But you can learn a lot from a CV, a letter of reference, or a phone call or two made to someone who knows the person and has worked with them. For me, as I’ve told a lot of people in person over the years, among the key things I look for is evidence that the person can juggle a lot of balls without dropping them — and, coz sooner or later we all drop a few, that they can quickly distinguish the balls that’ll bounce back up from the eggs that’ll fall flat and crack. (Case in point, not all deadlines are firm and so you can miss some — but not others!) You know, I’ve always thought that smarts isn’t what gets someone through a PhD; instead, it’s discipline and stick-to-it-iveness — the ability to stay with a topic no matter how boring it inevitably gets (and they all do get boring sooner or later), chase down the details that’ll only live in the footnotes, and re-read that manuscript just one more time to find the typos that keep eluding yoo. Much the same, I think that effectively multitasking is the greatest skill that a faculty member can have — whether tenure track or tenured. Can you do your course prep and teach and grade and hold office hours while working on that new course proposal we talked about last week as you also revise this manuscript, begin that conference paper, and look into a grant despite tomorrow movie night with the undergrads, advising next week, and helping a grad student with the article he’s soon presenting to the Department’s journal group? While you’ll draw on a variety of skills and expertise to carry out any one of those tasks, doing so with varying levels of success (after all, we’re not all equally excellent at all things), the ability to carry out all that we do in our careers requires us to be nimble and adept jugglers — and do your application materials suggest your able to do that, even at your early stage? While completing a dissertation is pretty important (though it’s the level playing field expected of all applicants, right? ), were you also gaining some teaching experience, trying to publish, getting involved in conferences (whether local or national), helping to plan some events in your Department or maybe working with undergrads during your degree…? What material can you put into our hands to help us imagine you with you office door open, with students stopping by while also making progress on the research topics that captivate you? With teaching experience in mind, I think that sometimes there can be too much of a good thing. While hiring someone with absolutely no classroom experience can be a pretty big risk, looking over the CV of someone who, while still a grad student, has taught 6 or 7 or 10 or 15 classes doesn’t necessarily mean that they’re more qualified. To me, teaching a class of your own comes with a pretty steep learning curve but it flattens out quickly; while becoming a really effective teacher can take years, getting a handle on many of a classroom’s demands can happen with only a few courses taught. So while someone applying with a huge amount of teaching experience, sometimes in many different courses, may very well provide a competitive advantage, it might also be the case that a search committee is satisfied with an applicant who has only taught a couple of times, content that they know their way around a class and that they know teaching experience is an important thing. After all, for all you know they’ll want to help the person develop their teaching in a rather specific direction, given the Department’s identity or strengths, so in such cases less can certainly be more. Come to think of it, the same applies to publications. While it’s not difficult to see someone on the job market intimidated by hearing about another applicant with 2 or 3 or more books already in print, more isn’t necessarily better. Just as with teaching, someone straight out of grad school with absolutely no publications (whether book reviews or articles) can elicit concern from a committee (especially one looking for that evidence, mentioned above, of the person being able, at their early stage, to demonstrate a variety of the skills needed to succeed in our profession), but someone with just a few things on their CV can be enough to satisfy them that the applicant can do it while doing something else too. Their logic? Demonstrate that you can write something, persuasively carry an argument through to its conclusion, weather the submission and peer review process, and get something in to print and we’ll be content that you can do it again. And again. And…, well, you get the picture, for this is one of the things that many of us just keep doing throughout our careers and tenure and promotion documents will have specific expectations of you when it comes to this. While the academic job market in our field is certainly a buyer’s market, as they say (something well beyond the control of you or I), it doesn’t necessarily mean that credential inflation dictates who gets hired. Which brings to mind the imprimatur of the places where you publish. Sure, we all want to see certain imprints on our own CV, whether that means they are actually good places to publish or not. As I recently wrote in a bit of a Twitter storm, there’s many reasons to be at different sorts of presses. A number of years ago an editor at a big name press, while I was walking around the book display at the annual @AARWeb @SBLsite conference, asked me why I publish at a press like @EQUINOXPUB — here’s why (in a few tweets)…. So aim high, sure, just as I tell anyone who asks my advice, but also know that just getting your work into print is accomplishment enough, let alone getting it reviewed or read. I’m sure there are Departments out there where they weigh the difference between this tenure track applicant with an Oxford University Press publication and that applicant with a Cambridge University Press publication; in my experience, though, we’re looking for evidence that you know that this too is required of us as faculty members and that you already have your foot in the door of the publishing game. Did you show a little entrepreneurial spirit by reviewing some books? Have you been going to conferences and trying to present your own work — whether at a grad student conference or a regional meeting? Maybe you carved out a small section of your dissertation (not too much of it, of course, since you don’t want to discourage a publisher from someday publishing it as a book) and its under consideration with a peer review journal…? Again, more isn’t necessarily better — coz if what we’re looking for is evidence that a career has begun, rather than that it is already in full swing, then we have pretty reasonable expectations. In my case, I was lucky enough to have OUP’s imprint on my CV when I was hired for my first tenure track position, but the book wasn’t out for more than a year after they hired me and, in hindsight, I tend to think they hired me because I could teach the world religions and intro courses (and, for all I know, I was the fourth choice they were forced to go to, after three others turned them down). So while that imprint may have played a role it might have also been irrelevant. So, given that you can’t control that, you aim high, like I said, but you also just aim to be representing as full a range of the career as you can, even if it’s only at a very early stage. While some committees might be critical of that, the ones I have familiarity with have no trouble taking people where they are now and, as I said above, trying to look a few years out, making a judgment where their work might take them. This post is too long, I know, but let me end with an anecdote, from a good friend, to make evident how these processes can work in practice. For I recall the story of how, some years after being hired tenure track, he chatted with his Dean one day, who remarked about why he was hired. While it surely rested on a variety of factors, in part it came down to the way my friend had put aside his academic paper, for his job talk a few years earlier, when it was apparent that the room was filled with undergrads. Instead of his planned paper, he just talked off the cuff about his work and why he did what he did, doing so in a way that a newcomer could understand. In the Dean’s recollection (for he was at that job talk too, likely sitting somewhere at the back, listening and watching…), that was the moment he decided to hire my friend — for he showed evidence that he could adapt, think quickly on his feet in a high pressure moment, and then just talk to 19 year olds in a way that engaged them. While not every school prioritizes undergrad teaching in the same way, of course, I recount that story here not only to suggest the (sometimes unstated) variables at play in any job search but also to give a peak behind the desk that separates interviewees from interviewers; for, as with that Dean, many of us are trying to make informed judgments about what we know it’ll take to succeed in our settings, hoping applicants provide us with enough raw material to make an informed but still speculative leap toward seeing them as part of our team — with their office door open, fielding student questions while planning the next majors fair and editing an essay that they hope to get into print. This entry was posted in Faculty Blog, Relevance of Humanities, Religion in Culture and tagged Applications, Job Interview, Jobs Market, Professionalization, research, Service, teaching by Russell McCutcheon. Bookmark the permalink. Thank you for the advice! It’s helpful.